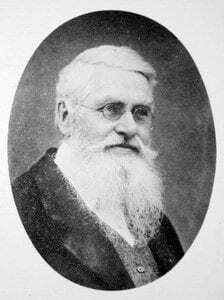 Alfred Russel Wallace, codiscoverer of the principle of natural selection was also the founder of the field of biogeography. Like Charles Darwin, he too had a vast experience of field work in South America (four years of professional collecting from 1848 – 1852). And like Charles Darwin, he too would credit the reading of Malthus’ On Population as a central stimulus for the key insight of natural selection. Wallace would live a long life. Beyond his remarkable insights into evolutionary biology, he would also be widely known for his ardent advocacy of spiritualism, land nationalization, anti-vaccinationism, and for much of his later life, a highly teleological view of evolution. Before Charles Darwin published his first clear (and public) statements on evolution in 1858 and 1859, Alfred Russel Wallace had already published a series of brilliant papers that bear on the process of evolution and species formation. The first of these papers (1855) “On the Law which has Regulated the Introduction of New Species” was to have an enormous impact on the thinking of Charles Lyell. The other papers, “On the Habits of the Orang-Utan of Borneo” (1856), “Attempts at a Natural Arrangement of Birds” (1856), “On the Natural History of the Aru Islands” (1857), “Note on the Theory of Permanent and Geographical Varieties” (1858) represent the most important published scholarship on evolution in the decade leading up to the Wallace and Darwin publications on the process of natural selection. There are many recent biographies of Alfred Russel Wallace. In addition, there are excellent websites with extensive information about the life, scholarship and collections of Wallace: The Alfred Russel Wallace Page, The Alfred Russel Wallace Website, and the Wallace Collection. There are many photographic portraits of Alfred Russel Wallace, spanning his extremely long life. Some were published in his books of the late nineteenth century and early twentieth centuries. There are also portraits that were used for cartes-de-visite (as is the case for the center portrait below).